She may come off as a bit scattered, but Julie can compete with the best of them at Bakugan. Julie would best be described as a little princess and in conversation she can be a little vacant. She’s bubbly, extroverted and adores Dan! She is his number one fan. Julie lives in the isolated Bakugan Valley. She is a master of direct attacks and uses Earth attributes in battle. She is a 16 year old, and through out the series, she acts more mature and she gets taller. Her change as the other characters though out each season; she wears pink in the first season, a bleached rainbow shirt with white shorts during New Vestroia, and a dark blue shirt and sometimes a green jacket in Gundalian Invaders. She also sometimes wears a cheerleading uniform and a cafe uniform. In the beginning of the series she only made appereances chatting with the Battle Brawlers in a chat room on the site, and would usually get eager to hear if Dan has won any battles or not. Julie is now 15, wearing new clothes like all others, and this time she does not have the same mutual feelings for Dan like she did in the first season, but is still dating Billy and gets postcards from him, time to time. She is seen with Marucho in the first episode, spying on Runo and Dan. When Drago asks for help everyone volunteers but Drago asks the girls and Marucho to turn around so Dan and Drago can come but Marucho enters the portal also. Julie and Runo are furious as the boys ditched them. Julie is later seen talking about Billy at the diner where the girls work restating the romantic bond between them. Julie returns to help Runo to get to New Vestroia and help Dan, Marucho, and Drago, which goes wrong and leaves Runo trapped between both world. In Gundalian Invaders, Julie has also moved to Bayview, like Dan, and works at a local cafe as a waitress. She turns out to be a cheerleader at Dan's school, cheering for Jake Vallory's team and was concerned about Dan's vision. 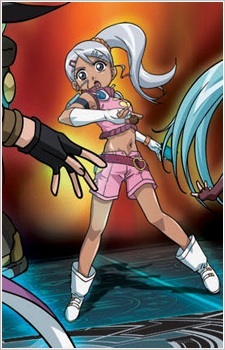 She is still part of the Brawlers and sometimes helps out with Bakugan Interspace. Due to a new bakugan evolution of Gorem, Quakix Gorem. It lead many fans to belive that she will continue brawling, but it was proven false since she never brawled in the entire season. Her role is now decreased from protagonist, to secondary, and now just a Minor character.